Seidlitz Family Blog: A LAN party? Adam and his friends introduced us to a new phenomenon (well, new to us at least). 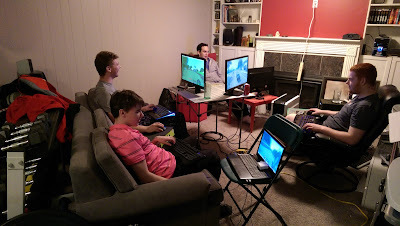 He and 3 of his friends have congregated in our basement with their computers, monitors, power cables, and a local area network (LAN) switch for the weekend. Once connected through this switch, they all play a video game together just as if they were in separate locations.